Lock & load! FEAR AGENT rides again! It's been a long time in the works, but Rick remender and I are thrilled to announce that our baby, FEAR AGENT, is finally available for digital reading through Comixology! You can also buy the meat-world editions of the paperbacks and hardcover collections here in the STORE. I also have ART PRINTS available. Since i missed yesterday, i thought i'd make it up with an extra nice one of my belligerent, drunken lovechild with Rick Remender, Heath Huston, star of our book FEAR AGENT. 8.5" x 9", markers on chipboard. The original art is over in my STORE. Fear Agent pages are rolling in, and Exterminators, Ghost Rider, Punisher, etc are all just around the corner! Keep checking back to see if anything you're interested in shows up. If it's not in the Gallery, it's not for sale. and i'm still not taking any new commissions. Thanks! i'll be invading France for the largest comic convention in the world, ANGOULEME 2009! January 29- February 1st, you can find me tagging along with Akileos, promoting the new French editions of Fear Agent! Fear Agent #23 out this week! Ron Richards at iFanboy.com seemed to have nice things to say. and the whole iFanboy crew gets together for a podcast review with a lot of love also! in other Fear Agent news, my friend Mike Hawthorne has done this gorgeous painting of Heath, of which he's producing a run of great giclee prints! buy the print on his site! here's the cover for Fear Agent: I Against I #6.
this is the solicitation version, which means i'll likely fiddle with it before it's all said and done. For those of you who use Myspace or Facebook, I've created pages for Fear Agent on each of these social networks. If you're a fan of the series, please add these pages to your profile and help us spread the word! here's the cover for Fear Agent #26, kickin' and a-gougin' in the mud and the blood and the beer. bigger view in the GALLERY. 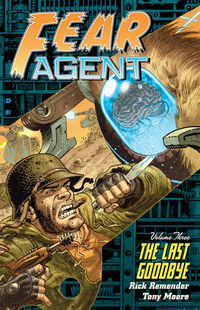 i've added the first 5 pages for Fear Agent #22 (I Against I #1) to the GALLERY, in the SEQUENTIAL STORYTELLING section. Click here to check it out. When you view the file for each page, click the "Full Size" icon above the image to enlarge enough to read. damn, i love this book. Dark Horse's GIANT Fear Agent Contest! Dark Horse Comics is holding an online contest where contestants have the chance to win all the Fear Agent graphic novels and original art by me, all signed by Rick Remender! Simply click here for your chance to win. And if you’re not one of our lucky winners, there’s still hope. Dark Horse is proud to present the entire first issue of Fear Agent Vol.3 online and for free! That’s right, 22 glorious pages available for your viewing pleasure. See the beginning of The Last Goodbye story-line by visiting Dark Horse's Fear Agent Vol.3 Preview. larger view in the Gallery. and i recently did a little interview with Newsarama regarding this upcoming Fear Agent run. Click here to Czech it out. Also, pour out a 40oz for Arthur C. Clarke, kids. R.I.P.